CHARLESTON, S.C. - Feeling the love with another baseball season just around the corner, the Charleston RiverDogs are providing their fans with another opportunity for the baseball fan in their life this holiday season as they announce their Valentine's Day packages, including a select few delivered by Charlie T. RiverDog. The "Date Night Pack" offers an upscale night out for two at The Joe, including two ticket vouchers to the Riley Park Club, redeemable for any available dates to The Club in 2019, a RiverDogs hat, and a bottle of champagne, all for $159. 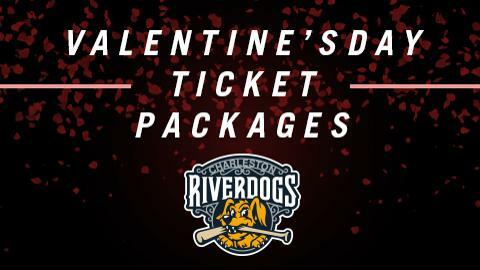 For $49, fans can purchase the "Valentine's Day Pack" for their baseball-starved significant other, including a pair of grandstand level ticket vouchers, a RiverDogs hat, bottle of champagne, and $10 worth of Doggie Dollars, in-stadium cash at The Joe. The first ten packages sold in the Lowcountry area will also receive a personal delivery from Charlie T. RiverDog himself, either on February 13 or 14. Interested fans are encouraged to contact the RiverDogs at 843-577-2647 (DOGS) or order immediately online via the links provided below to secure your delivery spot as soon as possible. All other packages sold after can be picked up at the RiverDogs front office or provided at the game the vouchers are redeemed for. On the heels of their second straight year eclipsing 300,000 fans through the turnstiles, the RiverDogs have already begun preparations for another year down at The Joe. RiverDogs season tickets, partial season plans, and group tickets, including options to the Riley Park Club, are now available for the 2019 campaign at riverdogs.com/tickets or by contacting the RiverDogs front office at 843-577-3647 (DOGS). The RiverDogs begin their home schedule on April 11 when they host the Greensboro Grasshoppers at The Joe, preceded by a weeklong road trip. A full schedule and list of game times for the 2019 season is available at riverdogs.com.